We have a 60 HP Yamaha 2-stroke FETO (autolube), circa 1990. I believe our prop is a 14" 3 blade, aluminium, recently refurbished, so virtually as good as new. We went out yesterday in pretty flat water, seemed to be trimmed correctly and the engine sounds perfectly fine, but could only get up to 26.7 knots at about 5300 rpm. Whilst this is fairly consistent with historic performance we were hoping for a speed gain as the hull has been cleaned, the prop previously had a huge chunk missing and the engine has been serviced (our RIB is a 4.8m Humber Destroyer I believe, with the shallow V). That 26.7 knots was SOG, but virtually at slack water, if anything the tide was with us but minimally. Is it simply the case that we have an old engine performing as expected, or should we expect to be able to get closer to 30 knots through the water? Seems a little slow. Do you have a bunch of weight aboard? Compression good? Over here Ali props are for all practical purposes disposable since no prop shop will work on them. Good thing they are fairly cheap. Not sure what you had done to "refurbish" the one you had, but you might consider replacing it. Or at least borrow a fresh one to see if it helps. Smallest Destroyer is 5.0m and all are deep V. As above,try a new Prop. Over here Ali props are for all practical purposes disposable since no prop shop will work on them. In terms of weight, we had approx. 50l of petrol on board, 3 people, ropes, lifebuoy etc, nothing unusual. 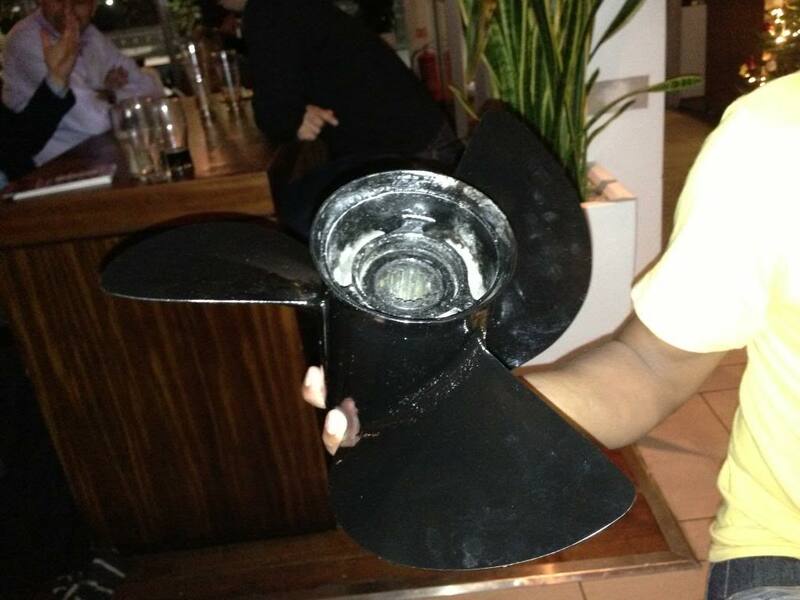 Do you always bring a propeller into the pub with you? Looks like they did a good job on it! Hmmm, maybe I mean the Assault then? Haha, well we were so excited at getting it back, we went out straight away to celebrate! The engine is 23 yrs old, and given the condition of the prop, not terribly well cared for. If it used to be faster, I'd look at compression next, maybe you aren't getting 60hp anymore. We only bought the boat 2 years ago, the prop has always been in poor condition, hence I assumed once fixed up performance would be better. I'm no mechanic, but my guess would be that we aren't getting 60HP anymore, like you say, its a very old engine, I just wondered if there was any other possible alternative!